German farrier Josh Feuerstein is immersed in his craft. The essence of his day is captured by these audio landscapes, and illustrated in high-definition snapshots that could be any farrier's day, anywhere. Nice work by flat36.com; Josh lives in Biesingen in Saarland, Germany. Go ahead and watch it in full-screen view. Please, no use without permission. You only need to ask. A horse at the mounted police stables in Dover, New Hampshire gets the benefit of a shoeing by veteran Jim Smith during a practice session for local farriers who plan to compete in July's World Championship for farriers at the Calgary Stampede in Canada. It's a long way to go, but New Hampshire pros Tim Bolduc of Fremont, Jim Smith of Milton Mills, George Barker of Gilmanton, and Nathaniel Bruss of Bradford are preparing to represent the "Live Free or Die" state and are being sponsored by the Horseshoes Plus farrier supply store in Barrington, NH. Click here to read a nice story about their practice session that appeared in yesterday's Foster Daily Democrat newspaper, and which included this and other photos of the team. Equine lameness specialist veterinarian Vandall E. Snow DVM of Santa Ynez, California was killed when the experimental plane he was piloting crashed near San Diego on Thursday. 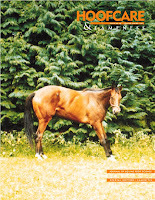 Van Snow was well-known in the field of equine lameness and had a special interest in the hoof. A graduate of the School of Veterinary Medicine at the University of California at Davis, he was the quintessential "early adopter" and experimented with Magnetic Resonance imaging of the foot, therapeutic shock wave, and many treatment protocols before most people had even considered their use. 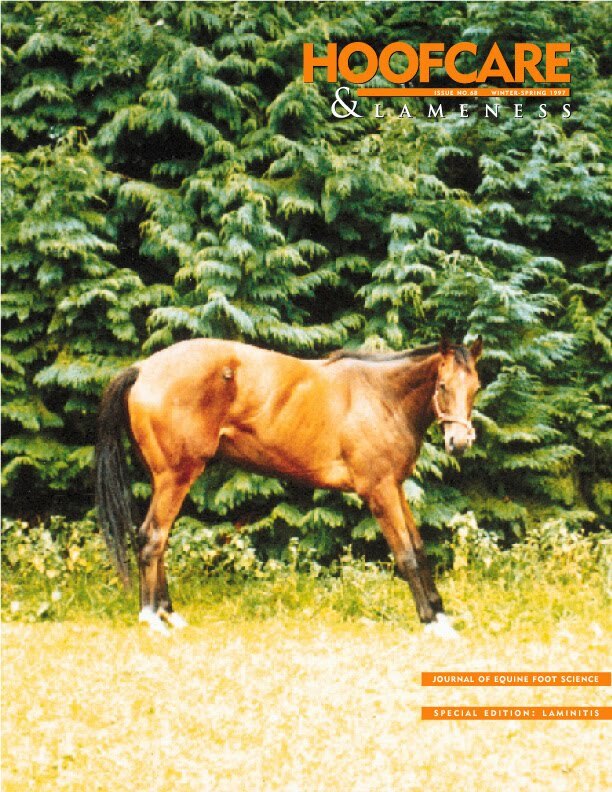 In 1996, he compiled, authored and published the visual image monograph Sectional Anatomy of the Equine Digit with MRI, edited by Norman Rantanen DVM. In the preface to that book, he predicted that veterinarians would be using Magnetic Resonance technology in the future, and that they would need to adjust to considering the foot's anatomy in three dimensions instead of two. 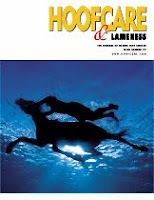 Hoofcare & Lameness was glad to work with Snow on the marketing of that book. 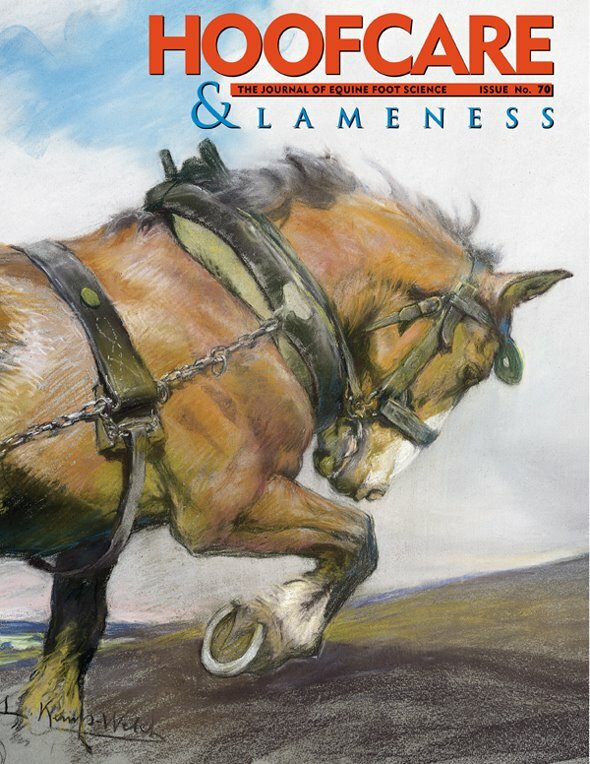 Snow also wrote a chapter in the text Diagnosis and Management of Lameness in the Horse by Ross and Dyson. 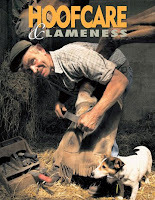 He first appeared on the Hoofcare & Lameness radar screen in 1990, when he partnered with the late farrier Don Birdsall, also of California, in one of the first vet-farrier teams to give lectures and demonstrations on hoof-related problems. Their 1990 AAEP and AFA presentations launched a new era of hoof balance study and their AAEP paper Specific Parameters Used to Evaluate Hoof Balance and Support became a hoof science classic reference. Dr. John Madigan, director of the School of Veterinary Medicine Teaching Hospital at UCDavis told the paper, "Dr. Snow’s contribution to equine medicine and surgery was invaluable. His findings are what veterinarians use today for reference material. Dr. Snow was a valued member of the equine community and we are proud to have him graduate from UC Davis." Snow owned Santa Lucia Farm, a rehabilitation and breeding farm in Santa Ynez, California. According to Quarter Horse News, a private burial service is planned for Saturday, April 17. On Sunday, April 18, a barbecue and celebration of Snow's life will be held at Santa Lucia Farm. Click here to read the longer but less horse-specific article in the Santa Maria Times. Thanks to Tom Trosin for his help with this article, and deepest sympathy to Van Snow's family and friends and to all the horses that I know he would have helped in the future. Female farriers in England can now benefit from a £450 (approximately $685 in US dollars) training grant from the national training organization, Lantra Sector Skills Council. The grant will enable all women working within the farriery industry including registered and apprentice farriers to develop their skills, careers and businesses until February 2011. Since the program began in March 2007, Lantra has helped 2,400 women working in male-dominated environmental and land-based industries to progress. According to The National Farrier Training Agency, Great Britain has 53 registered female farriers and 33 female farriery apprentices who could benefit from the program. For more information or to register your interest email connect@lantra.co.uk or visit www.lantra.co.uk/WomenandWork. If you are anything like me, you've been riveted to the news this week, and your emotions have run the gamut as hopes have risen and fallen so many times in the race to reach the miners trapped in the West Virginia coal mine. This video shows you some of the last employed pit ponies in Britain; the voice is poet John Stafford, who eulogizes a pony named Dot. Dot was one of the last pit ponies to work at Annesley Colliery in Nottinghamshire, England. Thinking about coal mines made me remember about the use of ponies, horses and mules deep below the ground in mines in North America, Australia and Europe. Perhaps they were used in other parts of the world, as well. Horses and ponies weren't used much, if at all, in mines in the British Isles until 1842, when an Act of Parliament outlawed women and children under the age of ten from working in coal mines. Up until then, it had been women and children who lugged or dragged the coal out of the mines. The pit ponies wore leather shields over their faces, like a solid bridle shield. Bare wires could cause sparks if a pony bumped into one. One statistic said that the ponies were not blind, as most people thought they would be from living in the dark, but a large percentage had lost at least one eye from accidents. In photos, you will notice that the pit ponies had their tails shaved, and probably their manes as well. Pit ponies in Britain were one of the first really big public animal welfare campaigns. 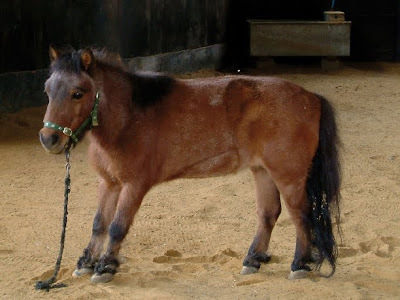 The RSPCA was concerned about the ponies, and campaigned so that ponies couldn't work more than 48 hours a week. But most of the companies took very good care of them. 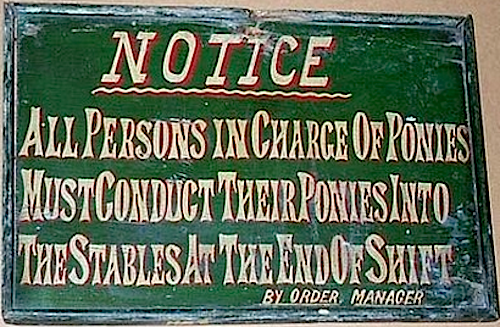 Many people said they took better care of the ponies than they did the miners. Good pit ponies were valuable and important to the success of the operation. But the public campaigned until finally the last pony kept underground was brought up to the surface in the 1980s. 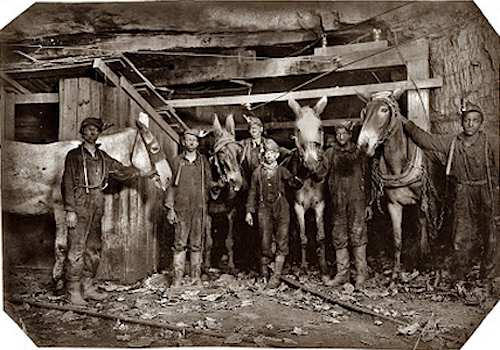 A1908 image from the Library of Congress shows us mules in a Pennsylvania coal mine. They wore ear hoods to prevent them from being shocked by low-hanging wires. No doubt, they learned to walk with their heads low. This was before there were any child labor laws in the United States. Notice that three of these young miners have whips around their necks. In the United States, mules were preferred in the mines, and some quite big draft mules went down the shafts and stayed there, sometimes for a year at a time. Mules were especially popular in Pennsylvania. Before US child labor laws were passed, most of the miners are boys who could get into smaller spaces. 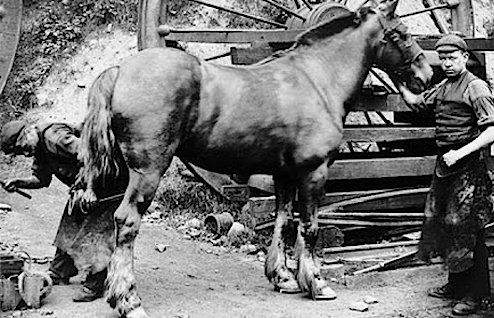 This horse was being shod by two young colliery farriers in Wales. Notice the horse is wearing a hood. His tail isn't shaved as is often seen in old photos, but his mane is roached. The collieries in Great Britain employed farriers. They repaired equipment, made chains and spent a lot of time sharpening the pick axes of the miners. One reports states that each miner took pride in his ax and would take it to the forge to be sharpened in a particular way that suited his way of picking at the mine face. Farriers understood how to please each miner. The farriers also made shoes for the ponies. When their work in the forge was done each day, the farriers went down the mine and shod the ponies as they finished a shift, or the ponies from another shift before they started. Ponies weren't allowed to work if they had a shoe off, so the farrier's visit was important. Every foot on every pony had to be lifted and looked at every day. This was a long, long day for a farrier. There was no light in the underground stables except for miner's lamps. The farrier would take the vessel out of his lamp and put it on his tool box, like a candle. He would have been trimming and shoeing almost by touch. Yes, there were hoof boots long ago. This one is from a mine in the Lake District in Cumbria, England, near the Scottish border. 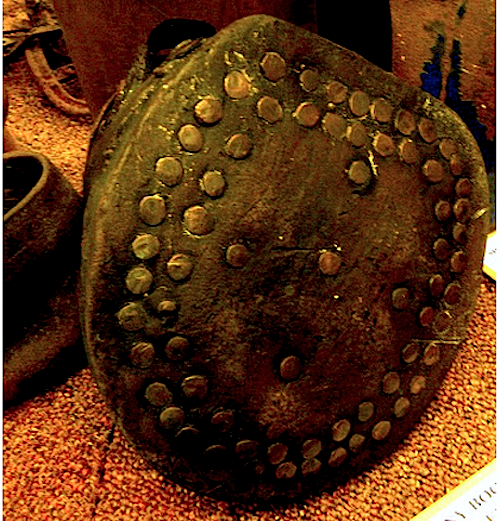 The sole of the boot is studded with copper rivets. You can see it at the Keswick Mining Museum. 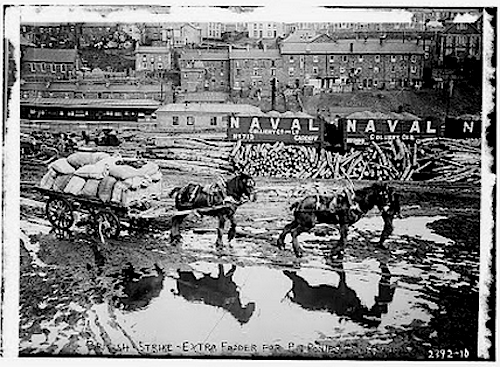 In coal mines and around explosives factories, horses were shod with copper alloy or "brass" (copper and zinc alloy) shoes and special brass nails made by Capewell Horse Nails and perhaps other companies. Brass didn't cause sparks the way that steel did. Perhaps that is also why horse amulets, called "brasses" are always made of brass. All the shoeing below ground was done cold, of course, in spite of all the available coal. Any spark could ignite a fire or, worse yet, an explosion, because of gasses and dust in the air. You've probably heard about canaries being kept in mines, or even being sent in ahead of the men. A canary would die from the gas long before a man or a mule or a pony, and they served as a warning of the danger in the air. Welsh miners lamps are especially interesting. Today, they're popular on wooden boats. They have a distinctive tall chimney and usually come with a hook at the top. Once British farrier Grant Moon, who competed under the Welsh flag, brought one of the USA as a special award, and told us about how the mine's name and mark were engraved into the chimney. They are special. The miner's lamp did a lot more than light the way through the mine. 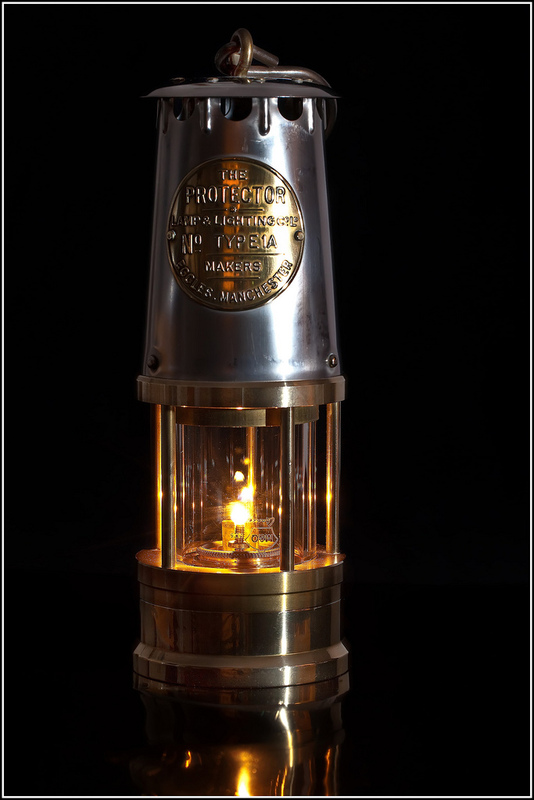 The color and height of the flame in the lamp was a means of constant feedback to the miner about the gases present in the air below ground. 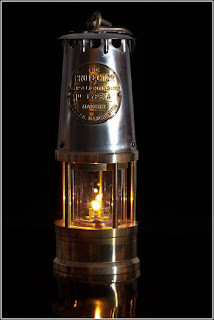 They were known as "safety lamps". They are small and you might overlook them. But a miner wouldn't. Many years ago I met a lovely gentleman from Yorkshire, England named Eric Plant, FWCF. He had worked as a farrier at a colliery and he was the first person who told me about pit ponies; I had no idea that as many as 70,000 ponies were working in Great Britain's mines in the early 1900s. Mr. Plant painstakingly photocopied all his booklets about pit ponies and the welfare movement to protect them and sent them to me. I always wanted to tape his stories, but I didn't have the privilege of seeing him again before he died. Most of the little facts about ponies and mining in this blog post came from my very precious file of Mr. Plant's memorabilia. Equine veterinarians and farriers are urged to “save the date” for a full-day program dedicated to advanced hoof care techniques during the American Association of Equine Practitioners’ 56th Annual Convention, December 4 – 8, 2010 in Baltimore, Maryland. The 56th Annual Convention will be held at the Baltimore Convention Center. With more than 100 available CE hours and a trade show with nearly 400 exhibitors, the convention provides the AAEP’s most comprehensive education experience. More details about the convention and registration will be announced closer to the event. Visit www.aaep.org for more information. April 5th is a black day in the history of horse racing. It's the day always remembered, and certainly not celebrated, as the day that the Australian racing legend Phar Lap died mysteriously while resting between races at a horse farm near San Francisco in 1932. You've probably seen the movie (a few favorite scenes are in the clip below); many people feel that it is the best horse-racing film ever made, and I'd agree. If you haven't seen it, you're really missing something! The circumstances surrounding Phar Lap's death will always be shrouded in mystery, no matter how many forensic tests are made and new theories are put forth. 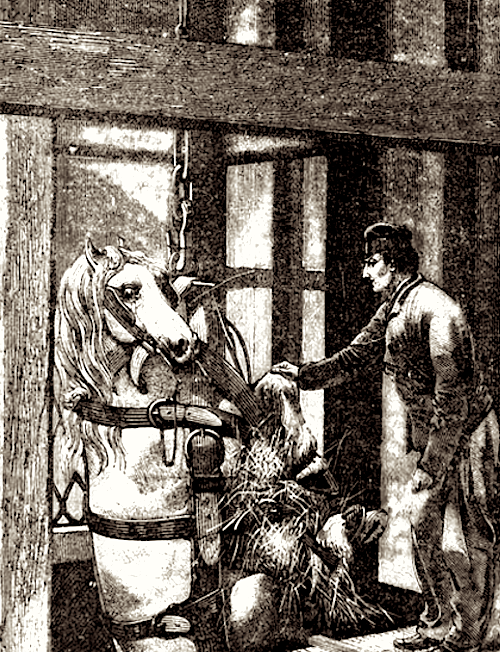 This horse's life and death were the stuff of fiction...and yet they really happened. Likewise, Phar Lap's world-famous quarter crack and his equally-famous bar shoes are the stuff of hoofcare legend. What many Americans don't know is what happened to Phar Lap after he died. He was sent to a taxidermist in New York, where his skeleton was assembled, his heart removed, and his hide preserved. The famous Jonas Brothers taxidermists of the American Museum of Natural History in New York worked on Phar Lap's model for four and a half months. The finished model of Phar Lap--that's his actual hide--is on display at the National Museum of Victoria. Click here to read more about the model. Phar Lap's heart is on display at the National Museum of Australia in Canberra. His enormous heart weighed 6.2 kg, or about 13.5 pounds! It is displayed in comparison to a normal-sized equine heart, which weighs about nine pounds. Read about Phar Lap's heart at the Museum's web site. Phar Lap's actual skeleton went home to New Zealand, where he'd been born. Phar Lap has been dead for 78 years, but he's still making news, according to Radio New Zealand. This year will be the 150th anniversary of the Melbourne Cup, and the Victorian Racing Minister has asked New Zealand to consider loaning the skeleton to Australia, in the hopes of reuniting all the known pieces of the magnificent horse. Click here to watch a television news report showing all the pieces of Phar Lap following today's request. This story still doesn't end. Phar Lap will always be in the news, in one way or another. My colleague, journalist Robin Marshall of New Zealand, has made a serious study of Phar Lap's skeleton and has been seriously campaigning for support that the skeleton was incorrectly assembled and does not do him justice. Phar Lap was 17.1 hands and Robin's analysis charges that the skeleton on display is not worthy of such a large horse. She says, "It might as well be a 15hh brumby!" Click here to read more about Robin's heartfelt campaign to restore Phar Lap's skeleton to his proper stature. And stay tuned for more news about Phar Lap...the horse whose legend is very much alive. Everyone still wants a piece of him: now, that's a hero! Jozsef Koszpek is an egg farrier. That's right. He shoes eggs. And he does it in a most beautiful way. 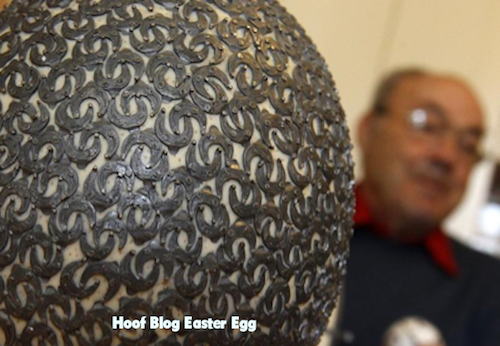 This egg is decordated with more than 1000 tiny horseshoes. Nice work, Jozsef! Hungarian tradition calls for Easter eggs to incorporate horseshoes into the design or pattern. Jozsef has perfected the ancient craft of actually applying tiny horseshoes to the eggs...and elevated it to an art form. Dr Hilary Clayton's 2010 Equinology Biomechanics and Gait Analysis Class: April 5 Deadline! The McPhail Center at Michigan State is one of the world's few research centers dedicated to researching the science of equine performance--from the ground up. Any number of research projects on aspects of equine movement, conformation or sport performance may be simultaneously underway under the direction of Dr. Hilary Clayton. It's 30 days and counting until it is time to join us at Michigan State University for the special four-day course in equine biomechanics and lameness at Michigan State University’s College of Veterinary Medicine’s Mary Anne McPhail Equine Performance Center, presented by Dr. Hilary Clayton. The course is offered through the Equinology study program. But the deadline to let Equinology know you want to attend is NOW. “This is a rare opportunity to see the McPhail Center from the inside,” Dr. Clayton told me last week. “One of the things people might not expect is that we’ll be working on neck and back dissections, and looking at some pathologies. For 3-D motion analysis, horses' joints must be palpated and markers applied to the centers of joint rotation. A marker out of place can ruin a lengthy evaluation session. In addition to covering biomechanics, conformation, and gait analysis in a classroom format, students will be privy to summaries of current research from around the world, as well as from the McPhail lab. Built-in force plates in the McPhail Center's arena can be used to determine loading and landing patterns and the location of the center of pressure on horses standing in place (or piaffing in place) or worked on a circle. Of special interest is the Center’s new coordinated system of six force plates. They are positioned for working horses within an arena, under the footing, in a circle or for standing the horse, so that one foot is on each force plate. “We use this system in research; a recent study tested posture and balance in foals,” Dr Clayton remarked. Another research project in progress at the McPhail Center is evaluating the use of side reins on horses: how do they affect the horse’s center of mass, particularly in different sizes and types of horses? Students will also learn about a special saddle developed and tested through the McPhail Center for use in therapeutic riding. Many hoof blog readers will be interested in Dr Clayton’s research on what is called simply “barefoot trimming” at Michigan State. Dr. Clayton’s recent study tracked the changes in feet maintained using a simply set of parameters; her documentation found that as the heels were consistently lowered, they did migrate caudally and that the palmar (or plantar) angle of the coffin bone increased proportionately. Dr. Clayton's research center equipment includes a motion analysis system, AMTI force plate, Noraxon EMG system, Pliance saddle pressure pad and other custom equipment for making measurements of horses and riders. This course will help sharpen your eye for irregularities, asymmetries and gait abnormalities through a variety of formats utilized in today’s industry. Your own visual appreciation of horse movement and your acumen for sensing abnormalities will be supported--and tested--by equipment used in the lab. For more information on research projects at the McPhail Center, please click here. Class Outline: Gait analysis and evaluation guideline, utilizing the data from the research equipment in the real world, conformation evaluation, locating palpation points for segment and angle measurements, analysis of conformation, anatomy and terminology, history of biomechanics, biomechanical techniques, equipometry discussion. About Dr Clayton: Hilary Clayton BVMS, PhD, MRCVS has been the Mary Anne McPhail Dressage Chair in Equine Sports Medicine at Michigan State University's College of Veterinary Medicine since July, 1997. As a veterinarian and researcher, Dr. Clayton's studies on the biomechanics of equine gait have focused on sport horses, including dressage and jumping horses. Some recent work has included videographic studies of Olympic dressage and jumping events and kinematic and kinetic research with some of the world's top dressage riders and horses in the Netherlands. 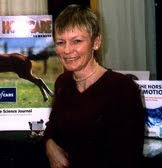 She is also the author of The Dynamic Horse and Conditioning Sport Horses and co-author of Activate Your Horse’s Core, Equine Locomotion and Clinical Anatomy of the Horse. Dr. Clayton needs no introduction when “biomechanics” is mentioned; she is one of the leading international specialists in the subject, particularly in the anatomy and function of the equine hoof and limb. Fees: The cost of the course is $995 (about $250 per day) and that fee includes course handouts and supplies. A $200 deposit is required to enroll. An additional weekend course in equine lameness with Dr Barb Crabbe is being offered for the days immediately preceding the four-day course. For full course details, please visit the Equinology website and click onto EQ300 or cut and paste this address: http://www.equinology.com/info/course.asp?courseid=12 (Dr. Clayton) and the EQ600 details can be found at: http://www.equinology.com/info/course.asp?courseid=78 (Dr. Crabbe). Join your Hoofcare & Lameness/Hoof Blog editor in this very special class. It could be the most important thing you do to jump-start your career in the direction of the future of equine lameness and hoof science. Get a head start: find out where this world of ours is going. See you there! On November 8-10, 2009, the American Association of Equine Practitioners (AAEP) Foundation hosted the Second AAEP Foundation Equine Laminitis Research Workshop in West Palm Beach, Florida. Nearly fifty researchers and laminitis experts from around the world met to prioritize future laminitis research needs. The group also explored specific questions about the direction and cost of future laminitis projects. The Second AAEP Foundation Equine Laminitis Research Workshop was designed to build upon the foundation established by the 2004 AAEP Foundation Laminitis Research Meeting, as well as other meetings that have been hosted by the Havemeyer Foundation and the International Equine Conference on Laminitis and Diseases of the Foot, over the past decade. The purpose of these meetings is to move the industry closer to unraveling the elusive mysteries of laminitis and help to develop effective strategies that will eventually lead to eradicating the disease. Participants in the November meeting were challenged to develop plans for collaboration between investigators and to identify specific priorities in laminitis research for the next ten years. This research workshop would not have been possible without the support of the following agency and corporate sponsors: AAEP Foundation, American Quarter Horse Foundation, Barbaro Memorial Fund (NTRA Charities), Intervet/Schering-Plough Animal Health and Morris Animal Foundation. The AAEP also recognizes supporters of this meeting including Marianne and John K. Castle, Margaret Hamilton Duprey, Gretchen and Roy Jackson, Elizabeth Moran, Denise and Michael Rotko, and Carol and Mark Zebrowski. This cooperative effort aims to identify priorities for the equine industry and benefit the owner, veterinarian, supporting industries and, most importantly, the horse. • Overview of What we Know about the Pathophysiology of Laminitis – by Susan Eades, PhD, DACVIM-LA. "The Little Horseshoe" Sidewalk Cafe in Paris, France, originally uploaded by Flemming Søgaard. Here's the third stop on our tour of the great pubs and pub signs of the world that honor the horse's hoof and its culture and craft. This time, we're leaving behind the heavy horses and forges depicted so beautifully inside and outside the British pubs. We've hopped across the English Channel to the sidewalks of Paris, widely believed to be the world's most beautiful city and home to the world's most sophisticated people. The "art" in this sense for this story is that the Parisians seem to have perfected the "art" of living well, and nowhere is this more evident than when you sit and watch Paris go by from a for-real Parisian sidewalk cafe. This one has signs lettered in florid art nouveau calligraphy.You won't need a menu; just look up and be reminded that you can have a cafe au lait, a beer, or an aperitif. Yet the cafe's name is in bold letters. No nonsense, so you won't forget where you are. And the name? I believe that Au petit fer a cheval translates, literally, to "of the small iron of a horse" or "The Little Horseshoe". Would you expect to see a cafe called that in big-city Paris? No, but that is all part of the charm of the city that never sleeps! From here you could hop on your bike and pedal over the National Veterinary College at Alfort, where Professor Jean-Marie Denoix shares his vast knowledge with students, and home to the museum of veterinary anatomy. You might also check out the historic forge at the stables of the Garde Republicaine (Republican Guard), a sort of national mounted police corps that parades through the streets of Paris with its own mounted marching band. 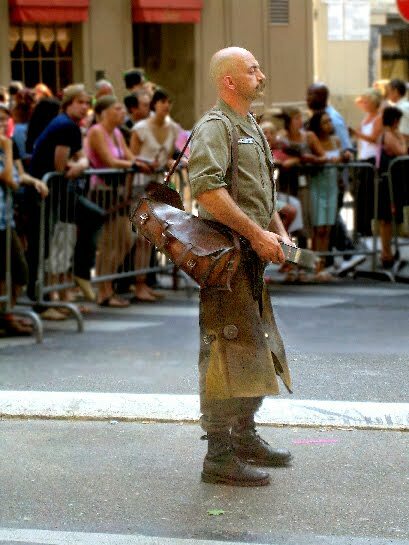 Think of them as a cross between the Royal Canadian Mounted Police and the Spanish Riding School...with all the savoir faire and mystery of the French Foreign Legion. The Garde Republicaine has an incredible tradition of horsemanship. When was the last time you tried this? Their attention to detail and tradition would be tough to top. And then there was the day one of the horses dumped his rider and took off through the city streets...click here to watch a video of a loose horse galloping through the sights of Paris. Perhaps our farrier friend was at the wheel of the pursuit vehicle.